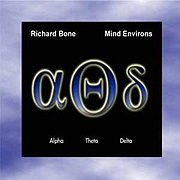 Mind Environs (30'22") is a CD release by Richard Bone, but it is also the name of the music application used to produce the three ambient works appearing on this album. By creating and then combining a number of atmospheric loops, Bone can sit back and listen to the beautiful harmonies, cloud soft melodies and ethereal textures that were pre-set to be synthesized through his computer. What with both Bone and his audience floating in the relaxed sonic space created with this music, this automatic activity just about does away with any demarcation between performer and audience. But somehow in listening to the sounds of Mind Environs we sense the artist's presence. This does not feel like cold process music, as the intellectual musical structures that Bone builds from software are warm and provide a remarkable sonic surrounding. A pared down version of the classic innovative lengthy works by Steve Roach, Bone's music here hopes to lull the listener into a pleasant twilight state. With its sounds of the sea lapping against the shoreline amidst mellow electric piano tones, breath slow low drones and the most heavenly electronic choir slowly modulating between chords, Mind Environs will attract fans of New Age music - while the more deep and somber forms should be of interest to those seeking a sense of awe and mystery in their music. But from whatever attitude Mind Environs is engaged, its slowing, dreamy inwardness transcends this music's machine made origins.